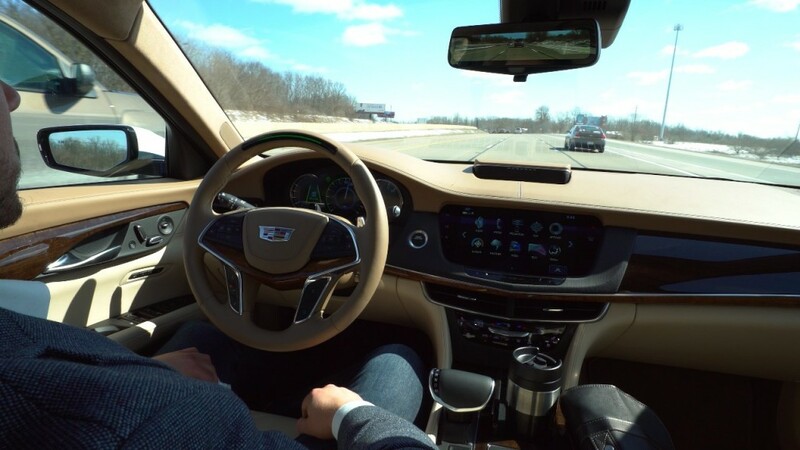 General Motors will introduce its long-awaited Super Cruise technology with the 2018 Cadillac CT6 this fall and the automaker has engineered a way to ensure drivers are paying attention. Unlike many other systems, Super Cruise does not require the driver to touch or provide an input to the steering wheel every so often. Other systems will call upon the driver to do this as a checkup to make sure they’re still alive and well. Here’s the problem: anyone can just touch the steering wheel while they’re busy texting, reading or doing anything else. Super Cruise leapfrogs this with a camera. The camera watches the driver’s head and eye movement to ensure they are paying attention while the technology operates the car in highway driving conditions. Should the driver become distracted, the camera picks up on it and flashes a series of warnings with audible chimes, notifications on the dash and will buzz the seat. Keep ignoring it and the CT6 will throw its flashers on and pull the vehicle off to the shoulder to a controlled stop. From there, OnStar is contacted to ensure the driver does not need assistance or that a medical emergency hasn’t arisen. However, good behavior will keep the system going and allow drivers to do other things like enjoy a cup of coffee hands-free from driving on the interstate. It’s not perfect, but GM ensured the system was as safeguarded as can be before rolling it out to the public. I don’t understand how this works. I get it from a technical standpoint, but what is the use of self driving tech if you can’t do anything? I mean could you imagine driving 5 hours and doing NOTHING? Yes, we’ve all been passengers, but thats doing SOMETHING. you can read, eat, look at something, text, research, etc. I guess you can listen to music or call someone, but I literally don’t know how I could sit there “attentively” doing nothing. I’d fall asleep at least! Pulling you over is a fair call. I have to pull over to stop my kids misbehaving. Great idea – already working well for Seeing Machines in Mining and Trucking for fatigue and distraction prevention. Prevents accidents before they happen. Super Cruise and the Seeing Machines eye tracking teach behind it are to be rolled out over 10 more models from the GM brands next year.